This is one heck of a historical!! I loved this book. Ms. Atwell weaves an enthralling story with enchanting characters through masterful writing. I was so doubtful about the book when I started it, but the writing is so amazing I couldn’t put the darned thing down! As I read on, the characters captivated me drawing me into the plot and I had to find out what would happen. Johanna’s parents, Duke and Duchess of Ambersley, die in a fire when she is very young. Traumatized by the ordeal, she doesn’t remember anything of her privileged past. Servants raise with a sense of helps her survive the betrayal that unmasks her true identity. 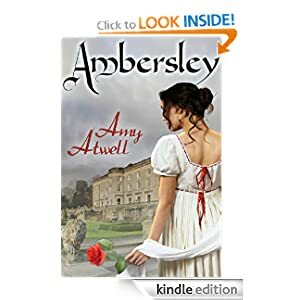 Once she is forced to take her proper place in Regency society as the highly sought heiress to the Ambersley fortune, she must defy the relatives who would make her a pawn in their struggle for power. When Derek Vaughan inherits the dukedom. his dubious parentage makes it a sacrilege to accept. But touched by the ravaged estate and its destitute staff, he braves a society that once shunned him while he rebuilds Ambersley and guards it from his stepmother’s bankrupting clutches. He intends to grant the title to his half-brother when the boy comes of age, but Derek’s plans go awry from the moment the gardener’s apprentice—once his trusted young friend—is revealed to be not only an heiress of beauty and spirit, but the one woman who may finally capture his heart. This is recommended reading from this reviewer. The beautiful prose and touching story met all my expectations. I can’t wait until Ms. Atwell writes another historical. She can’t turn them out too soon as far as I’m concerned. Thank you Amy for a wonderfully warm and enthralling read. I give this book 5 slices of the pie. I picked this book up as a freebie several months ago as a freebie for my kindle several months ago. In need of a book to read while at break, I tore into this one. I am fairly new to romance and the wonderful authors writing such amazing stories and this was a find as far as I was concerned. This book was written several years ago, 1994 to be exact. As a writer learning to perfect my craft, this book inspired me. 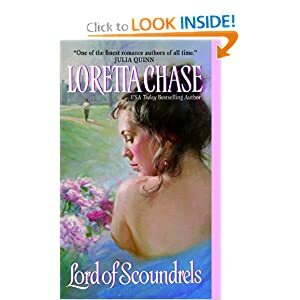 I’ve never read Loretta Chase before, but I will now. The hero is damaged and strong and flawed and yet he can grow and become a better man. He is the sort of man I hope to write as one of my heroes. The heroine is strong and willful. She knows how to make him a better man yet she doesn’t sacrifice any of her integrity or her standards. Great inspiration for a new authoress. This is a historical set in the Regency era of England. Sebastian Ballister the Marquess of Dain is known throughout society as amoral and callous. Jessica Trent is set on rescuing her nitwit of a brother from Lord Dain’s horrible influences. Little does she realize a passion exists between them that culminates in a compromising position for which Jessica demand’s satisfaction. Sebastian wants only to put the annoying bluestocking in her place, but when he’s forced to salvage her reputation he finds keeping aloof and shielding his heart from her many charms more than a man can stand. You have to read this to experience the twists and turns the author takes on our journey to these two finding true love. This is such a great story and timeless as ever. I give this one 5 slices from my pie. I just finished a western novel by, at the time, a first time author. 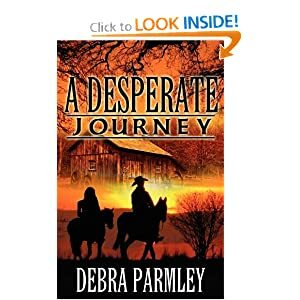 I’m talking about A Desperate Journey by Debra Parmley. As an aspiring author, I love to read debut books. It gives me hope for my own work. This is a wonderful story. Ms. Parmley has an excellent sense of pacing and all the troubles our heroine encounters are compelling and drive the story very well. Sally Wheeler comes back to her homestead after helping a neighbor to find her husband, Luke, is gone and her son with him. Sally finds an old trail boss to take her to Texas. Following her is a man hell bent on finding Luke for his own revenge. When she discovers Rob on her trail, she invites him to go with her, much against her better judgement. Worse yet, she finds herself falling in love with him. Who wouldn’t after he saves her life a couple of times from the terrible dangers they encounter. I love Ms. Parmley’s voice and the wonderful western language. Westerns are a favorite of mine so I have great base for the feel of them and the language. She did a great job with this. Debra Parmley will have another novella out in Feb 2012 called Dangerous Ties. I wish her all the best with her new release. Last month I was privileged to read four wonderful historical novels for a reader choice contest. I love historical romances. One of the selections included a book by Anna Campbell. Intent upon the seduction that will finally free her, Diana has set her sights on the notorious Ashcroft – never dreaming that there is much more to the enigmatic rogue than sin and deviltry. His kiss is bewitching, his caress intoxicating – and even the dangerous secret Diana must protect cannot shield her from Ashcroft’s dark allure. Unwittingly yet most willingly, they are playing with fire. Now the fuse has been lit and there is no escape…except surrender. This book is without a doubt the most sensuous, charming, romantic romance I have read for quite a while. The first page pulls you in and never lets you go. The hero, Tarquin, is an intriguing and marvelously delicious rake, while Diana Carrick is an innocent temptress against whom he has no defenses. The tension Ms. Campbell weaves throughout the entire story culminates in a dramatic fall from grace. The depths of despair will ravage you until you reach the pinnacle of forgiveness that true love can bring. I loved this book. It is no wonder this book was voted favorite historical romance of the year 2010. It is well deserved. This book earns five slices on Nena’s Slice of Heaven meter. Thank you Anna for such wonderful stories.